The first time I ever heard anything about fishing for calico bass at night was when I was hanging out at a local fishing tackle shop near my house when I was around 10 years old. 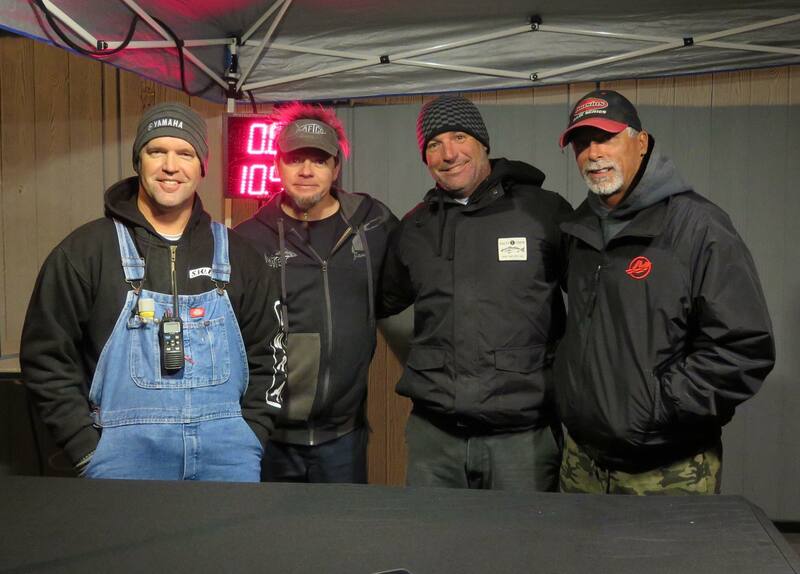 The “old timers” would come into the tackle shop and share their stories about the big bass they had caught while fishing the Federal break wall or as they referred to it “The Wall”. They would tell stories about the monster bass they hooked and were never able to turn before they made it back to the safety of their home among the rocks. I remember a gentleman coming into the tackle shop early one Saturday morning after he had spent the night before on the water and he invited me to peak into his live well in his boat and when I did, I saw some of the largest calicos bass of my life. He removed the largest calico from his live well and brought inside the store where he proceeded to place it on the scale. As we all stared at the needle on the scale and watched it bouncing randomly, back and forth until it finally came to rest on 11 ¾ pounds I knew at that time bass fishing was for me. Each time someone would talk about bass fishing in the tackle shop I was glued to their stories and could not wait to get my own boat. Finally, I was invited to go out fishing at night with Red Cartwright or as he was known around the shop “Red”. He took me up the line near the Point Vicente area and once up there he metered around until he found that honey hole. Hoochie Toad: was a deadly weapon in the hands of yesteryear’s Calico Bass Fisherman. His first cast with a yellow and green “Hoochie Toad” was engulfed by a solid 5-pound calico bass and from that point on it was a wide-open bite on calicos and sand bass in the 4 to 8 pound range on jigs and hoochie toads. From that point on I was hooked on fishing and I was determined to get me a boat, so I could experience this inshore fishery. I got my first boat when I was around 14 and started fishing the wall. I continued to hear from fishermen that came into the tackle shop of the big bass on the “Stones” off of Long Beach . I continued to asked questions and one day I started “Pinheading” on a local sport fishing boat and eventually got a job as a deckhand. As a young boy, I began to gather data on all of the different fishing spots during this time. I gathered some of my most valuable information while working on the Sea Sport out of 22nd Street Landing. The Sea Sport ran ¾ day and half-day trips so all of the information I gathered was well within the range of my little 12-foot skiff. Back then, we used land bearings to set up on spots and it was a major challenge to find these bearings at night, but overtime I became pretty proficient at it. Experience Pays off: Many anglers have learned to fish Calico Bass by fishing or working on the sport boats in Southern California and then graduated to buying boats of their own. My first trip out, I set up on a spot known as Indian Wells and I sent a live mackerel down to the bottom with 25 pound line and I waited. A short time later, I got picked up and the fish pulled line off the reel at a steady pace. I put the reel into gear and as the rod loaded up, I set the hook. The fish pulled harder than any fish I had hooked before and after what seemed like an eternity I landed a solid 7 pound calico, which I verified on my Langley “De-liar scale”. From that point on, I began doing a large amount of my calico bass fishing at night on the Horseshoe Kelp also fondly called The Shoe. Let’s begin by defining what is considered a trophy calico and sand bass bass. Everyone will have their own opinion, but from my perspective, any bass up to 7lbs. are nice fish, fish over 8lbs are trophies, and a bass 10 pounds or larger is a fish of a lifetime, especially a calico. 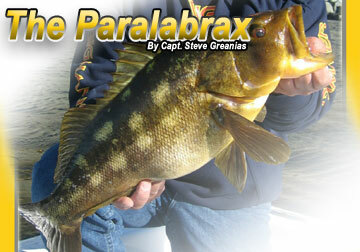 Anglers fishing the Breakwall or deep-water structure at night have landed more Trophy Bass. In order to be successful at bass fishing, the first thing you must do is to develop a sense of feel for the relationship of the structure, your bait or lure, and the changing position of the boat. The ability to perform these activities is magnified at night since your perception is impaired. Without this sense, you will be at a great disadvantage and you will find yourself fishing outside the “zone”. The only way to develop this skill is to spend lots of time on the water at night. As with fishing during the daytime for calico bass, structure plays just as an important role at night. I consider the “Wall” as one of the most simplistic type of structure fishing. 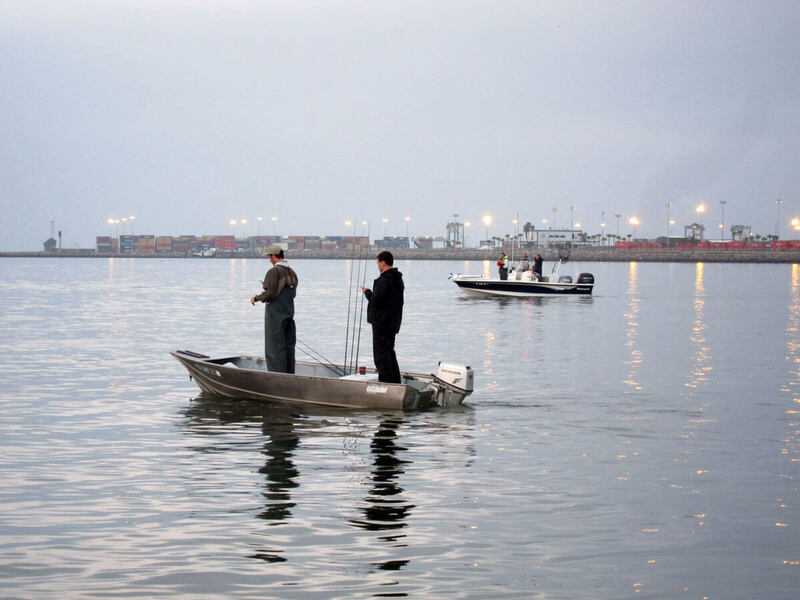 I know there are many different aspects to fishing the wall; but in general, the structure is above the water and now a days with all of the new construction in the Los Angles/Long Beach Harbors there is plenty of lights to illuminate the area. I have always found fishing the deeper structure spots on the “Shoe” and up the line towards Point Vicente area at night more challenging and more consist for the real trophy bass. .With all of the books, maps and other resources available today, finding the structure is not the difficult part, but the problem comes once you have located it. After you have located the structure you are faced with two decisions, how best to fish the structure and when to fish it. Every spot has its own “Window of Opportunity”. In other words, a spot will normally produce best when all of the conditions required to trigger the fish to feed come together for that specific period of time. There are many factors that will dictate if a spot is going to bite. When I fish at night, I determine where I am going to fish based on tidal movement, current and visibility. When fishing at night I like fishing structure that is located in 70 to 100 feet of water in the winter months, but in the summer months, I will shift my attention anywhere from rocks (boilers) in the surf to structure located in 70 feet of water. In the winter months I have had some wide open bass bites when the water temperature has been in the mid to high 50s, but the bass are more likely to eat live bait than artificial lures. However, when the water temperature climbs to 60 to 64 and higher that is when the bass become more aggressive and good top water and swimbait bites are not uncommon. Wayne ‘The Train’ displays this 7+lb. Sand bass, which was caught on a hard bottom/Sand edge. When searching for toad sand bass I will begin looking for structure consisting of hard bottom and sand. 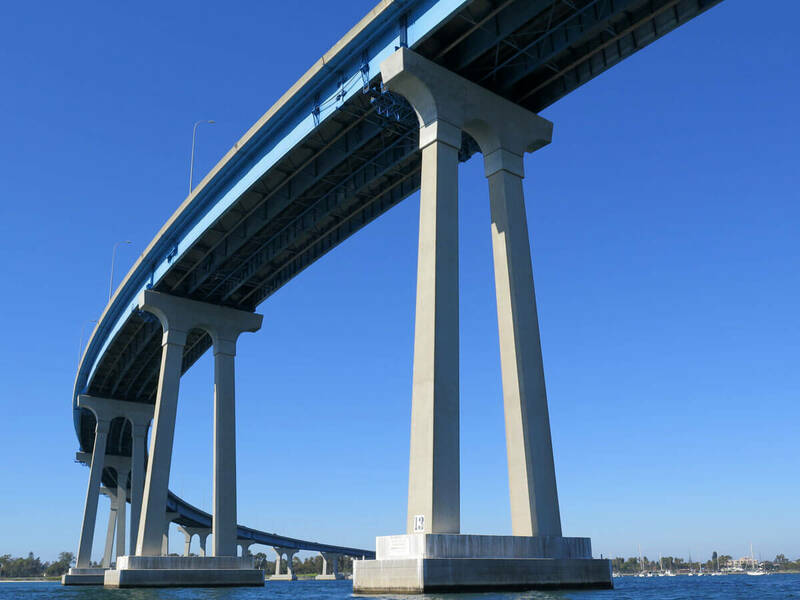 There are areas south of the Long Beach Harbor that you can make ¼ to ½ mile drifts along these edges and catch some big sand bass. I have found the most productive calico spots at night are structure that are in close proximity to secondary structure such as kelp and rocks. For instance, there are many hard bottom spots and “missed loads” (accidentally dropped quarry rocks) a very short distance from the breakwall and these areas can produce very well at night on an outgoing tide. The bass will move into the wall to feed on the incoming tide and move back out to the deeper structure on the outgoing. Case in point, February 1993, full moon night, 7.0 high tide at 4:00 p.m. and dropping to -2 at approximately 12:00 a.m. My good fishing buddy Wayne Eckenrode and I were enjoying a good calico bass bite on the wall with plenty of the 2 to 4 pounds fish and around 11:00 p.m. the bite shut off. We were fishing a small ridge that runs from wall and tapers to a hard rock bottom out to over 50 feet of water. The fish were tight against the wall and as the tide receded so did the bass. At slack tide we motor around looking at other spots and returned to the ridge around 1:30 a.m. and got set up. We were throwing live mackerel on 30 pound line and the bass started to build and finally around 3:30 a.m. the big boys arrived. Wayne was the first to get bit and landed a nice calico bass and within a 45 minute window we had 11 bass ranging from 6 to just over 10 pounds. From our experience of fishing bass at night, we knew these fish would move along the spine of the ridge and out to the deeper structure during the outgoing tide. The key was to have the anchor set during the slack tide and wait for the fish on the wall to reload the deeper structure spot. I believe if we would have arrived any later and tried setting the anchor (we had to reset the anchor 3 times before the boat laid in the correct position) we would have spooked the fish and may have not experienced calico bass fishing at its finest. Big Fish Spot: Lost count of how many fish over 8lbs. we’ve caught here. There are hundreds of spots to fish at night for calicos, but nighttime calico bass fishing starts for me on the West end of the Horseshoe, since there is a lot of good solid structure spots and it is only a short run up to the Point Vicente area if the bite does not materialize on the Shoe. During the winter months when you have a few days of stable weather and there are good tide swings after 12:00 a.m. that is when I will begin searching for the trophy bass. When metering structure it is not uncommon not to meter any bass on or near the structure, but you soon find out after your first few casts that there are fish at home. The reason for this there may only be one or two big fish on a specific piece of structure, and it is almost impossible to mark them on your meter because they are hugging tight to the bottom. However, there is one thing that can make these bigger bass move off of the bottom and suspend and making those beautiful inverted “V’s” on your meter and that is current. You will notice that once the current starts to move a spot that appeared to be dead will suddenly come to life. The bass will raise and suspend over the structure, down current or even up current from the spot, which makes it easier to mark them on your meter and to know where to set your anchor or start your drift. I cannot stress enough the dynamic contrast of fishing at night versus the daytime. During the day you are able to spot the dark spots from a safe distance, but these submerged boilers can quickly become your worst nightmare at night. At night, kelp, rocks and waves come out from nowhere. Case in point, approximately 25 years ago I was fishing with fishing buddy Wayne one night. We were fishing the inside reef at Point Fermin and on this particular night there was a large swell with a light wind gently pushing the swell over the top of the reef . We were fishing live mackerel and herring on 30-pound outfits. The calico bass fishing was phenomenal and every cast with live bait produced a calico over 5 pounds. As we made our last cast to the reef before repositioning the boat from out of the darkness a wave peaked, broke and crashed on top of my boat 14-foot aluminum boat. I was fishing on the front deck and running the trolling motor when we were struck by the wave and the force of the water knocked me off the front deck and into the water. Thank God I had my life jacket on and the only thing that happen to me was a bruised ego and wet cloths. SO BE CAREFUL!! Good tidal movement plays a major role in catching bass at night. We are all very familiar with the fishing calendars that predict good, fair and poor fishing days. These predications are based on phases of the moon and while the value of this information is debatable I believe moon phases do play a valuable role in calico bass fishing. I like fishing on nights where there are higher than normal tides that peak around 12:00 a.m. to 3:30 a.m. These types of tides normally occur during a new moon and full moon when there is more of a gravitational pull on the earth. I have had some great top water bites up the line near Portuguese Point and Marine land Reef on clear full moon nights. My experience has shown that I have caught more calicos over 8 pounds on clear nights and on outgoing tides. In addition, time is a factor. I have caught most of my bigger bass during the period between 12:30 a.m. and 3:00 a.m. , but don’t rule out gray light for another golden opportunity to catch trophy bass. As you can see, there is a very small window that I have caught the majority of my larger fish. I like arriving at a spot during “Slack” tide or soon after so I can get set up on the spot and wait for the tide to reverse itself. More times than not the fish will begin feeding soon after the tide changes and you need to be in the best possible position and ready to go. Remember, tide is one factor and current is just as important. It is possible to have a strong current during slack tide and have the fish go on the chew. So, I like good tide swings with current. When fishing at night you need to remember that just because the water appears to be dark does not mean it has poor visibility. The water looks dark only because there is a limited amount of light to penetrate the water. When fishing at night, I view visibility on two levels. First, it is the amount natural light being generated from the moon, and stars; such as what occurs on a full moon night. Second, is the artificial lights generated from boats, oil islands and other sources. It may not seem like a large amount of light is generated from these objects; however fish are more sensitive to light than people and this can play a large role in their behavior and feeding patterns. For instance, during the spring when the sand bass make their annual appearance on the Huntington Flats area, twilight boats will either place a light source over the side of the boat or turn on their deck lights. These lights will attract the sand bass and draw them from the bottom and they will begin to stack up under the lights. To illustrate how little light is needed to change the feeding habits of bass I was out fishing near the Shoe one night and after locating a piece of structure I wanted to fish only to find out the bass were not in a corporative mood. I notice a freighter anchored approximately ¼ mile from the spot we were fishing and I motored over to it to enjoy the “WOW” factor of the size of this mammoth ship. It was very dark night, heavy cloud cover, and the ship had no lights shining onto the water except for a small light on an extension cord dangling over the port side of the ship. The light was about 25 feet above the water and the light was so weak it could barely cast any light onto the water. We worked our way down the port side of the ship and could not buy a strike. As we approached the hanging light, my partner made his last cast for the night and his lure landed under where the light was hovering over the water. He got picked up on the sink immediately and he set the hook on a nice size sand bass. For the next few hours, we fished this small area and enjoyed a great calico and sand bass bite on 2 to 3 pound fish. As long as your lure was within 20 feet of the light you got bit. So the moral of the story, do not discount even the smallest amount of light when fishing at night. Take note that compared to sand bass, calico bass are not as attracted to lights as well. I have had good calico bass bites shut off when our deck lights on the boat were turned on and the light hit the water. On full moon nights I have found that bass will move off the bottom and suspend over a piece of structure more readily. The area along Point Fermin can produce well on a full moon night when the tidal and current conditions are right. The bass seem to move from the deeper water and up near the reef to feed. I have had some steady top water bites here over the years. A friend of mine consistently catches large calico bass in the 8 to 10 pound class at night on surface iron. I have caught a few fish on the iron at night, but I do not have the confidence to fish the iron as hard as he does at night. Positioning the boat so you can fish a specific piece of structure at the best possible drifting/casting angle is critical to your success. It is difficult enough to maintain boat control in freshwater, but consistently accomplishing this task in saltwater is a skill very few anglers achieve. When fishing deep structure it is essential to position the boat so the lure is being properly presented and maintained in the target zone for as long as possible all while the wind, current and swell are working against you. When approaching a spot, meter the spot and look for baitfish suspended over the structure or up or down current from the spot. When I am metering a spot I look for bait that is in small tight balls suspended over the structure or in close proximity to it. I do not like to see “Huge Bait Balls” sitting on top of the structure. 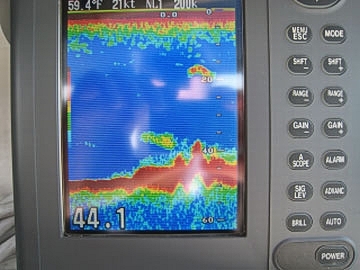 Probably the most common mistake most newcomers make is that they will look for marks on the meter that look like fish and if they do not see any meter marks they move on to another spot. I use my meter to locate the structure first and then bait. If the spot has structure and bait I have just tipped the scale in my favor. 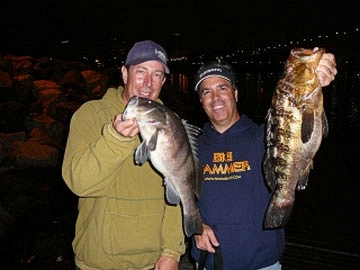 Unlike sand bass, which are easier to identify because they will school and stack up on or near a spot, large calico bass more times than not will hang tight to the structure and are more difficult to mark because there may only be one or two large bass on a specific piece of structure. Once you metered a spot the challenge then becomes trying to return to the spot after you have completed a drift. You need a point of reference to line up on and at night this becomes even harder to find. By having a point of reference it enables you to efficiently work an area and increase your chances of catching fish. Tools of the Trade: When targeting deep water Bass, it is imperative that anglers utilize a good marker buoy system in order to orient themselves to the structure below. A valuable tool for this is a marker buoy. There are many different types of marker buoys on the market today, but most are design for fresh water and do little good in the harsh saltwater environments. The best types of buoys I have found are those that are large and painted a fluorescent red or green, which makes them more visible in low light conditions and rough sea conditions. In the early days, I would paint my buoys a light gray or black, so they would blend into the marine environmental minimizing another fisherman or as I called them a “Spot Snatcher” from making my little honey hole a community spot. In addition, I prefer the type of buoy that is equipped with a friction disc or other mechanism that stops the buoy from deploying out line after the weight has hit the bottom ensuring the buoy stays directly to the spot. The weight that is attached to the buoy is as important as the buoy itself. I have found the best type of weight is the type that is designed with flat sides. The flat side design aids in minimizing the weight from rolling. The weight should be at least 5 pounds and at a minimum you should have 2 buoys available. 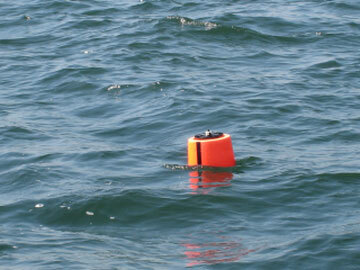 By having more than one buoy you are able to mark out an area and identify several different bottom structures. I will carry up to 5 buoys and will number them with reflective tape. By numbering the buoys allows me to identify them when developing a plan of attack with my partner. Last but not least; it is recommended you attach a cyalume stick (glow stick) to the buoy. Without a glow stick it becomes very hard to see the buoy at night and could become a hazard for a passing boater. Once you have located your spot, deploy the buoy down current from the spot to mark it. 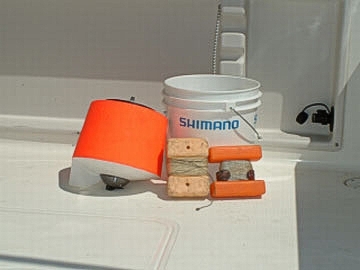 In general, I place the buoy down current, because this will ensure that the buoy will not drift back over the spot and drag the weight through the prime fishing area if the weight does not hold to the bottom. However, you may have to switch tactics if the fish appear to be stacked down current from the spot. Let’s discuss spots. As I mentioned earlier there are many spots that produce great bass fishing during the day only to be void of life at night. The Horseshoe Kelp holds very little kelp these days, but its attributes are lots of hard rock bottom with some scattered large rocks and a little submerged kelp. This is just the type of structure that attracts and holds both resident and migratory fish. 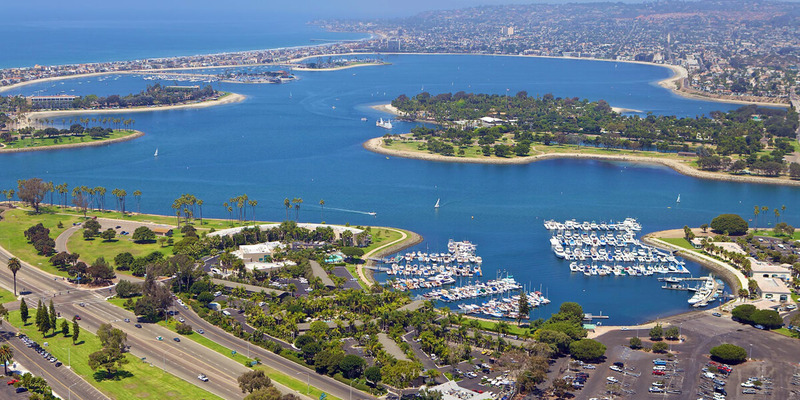 Since the Shoe is only a few miles from the Long Beach Harbor entrance it gets hit hard, which guarantees the resident bass are well educated. When fishing the shoe warm, current traveling in an easterly or southeasterly can be good. I preferred water temperatures in the 60s with a nice downhill current for most of the spots on the Shoe. Why is this important? Because when pulling up to a spot and you see the current is pushing uphill don’t waste your time and keep moving until you find the right conditions. As I mentioned in the introduction, Indian Wells (IW) has some of the best calico bass fishing on the Shoe in years past. With all of the dredging and other work being done in this area you have to search the area for isolated spots to find the fish. The IW is basically one large rock approximately 60 to 70 feet in size and in the past there was a lot of kelp growing on the rock. There are still patches of kelp, but it is nothing like it was before. This spot can be very productive at night and the bass seem to hold tight to the bottom at night as pose to suspending over the structure. A short distance from the IW is another productive spot. 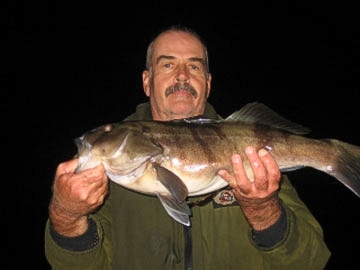 Olympic Rock is a spot that can produce nice quality calicos at night and I have caught some big sheephead here while throwing squid pinned onto a lead head. Other spots that can be productive in the dark are Jewfish Rock, and Old Southeast Rock. The 15 Fathom Curve is another great area for the larger calicos. When the conditions are right and the calicos bass are on the chew it is possible to follow the curve from spot to spot and catch calicos bass all night long. When the squid are out front on the outside of the Rock Pile the bigger calicos and sand bass will follow the squid in and it can be very productive. Depending on the type of meter you have balls of squid at night will generally appear blue in color such as it does on my Furuno meter. I have had more than one big bass fall victim to a live squid in this area. When you hear that the squid is on the Shoe this is the first place I start searching for the trophy bass. The 7-minute wreck has produced some nice sand bass at night over the years, but the wreck is becoming less productive in recent years. The 14 minutes wreck is another one of those wrecks that are either on or it’s off. There is three parts to this wreck each with about a 10-foot relief. Once you locate a piece of the wreck, begin metering around and you will find the other sections. They are approximately 25 to 50 feet apart from each other. I have caught more calico off this spot at night than sand bass, but nothing over 6 pounds. The Izor reefs can be a great spot for nighttime fishing. I have fished these series of reefs more when I worked off the sport boats but they do consistently produce quality bass. There is one observation I have noticed, when the sand bass are in their spawn mode and are schooled up out on “The Mud” I normally do not do very well on these reefs at night. The Huntington Beach oil rigs, Emmy and Eva can be good for quantity but the bigger models are normally roaming the hard bottom and structure spots off of these rigs or they are hanging tight underneath the rigs. We use to do well for the bigger bass fishing brown bait under the rigs. We would turn off the main motor on my 14-foot skiff and use the trolling motor to maneuver the boat under the rigs. Using 25 pound outfits and a short rod we would drop the live brown bait on a 3/4oz or 1oz sliding egg sinker next to the pilings. When you go bit HANG ON! These rigs are still good at night but since 9/11 it is a littler harder to fish. East Rock can be a fair spot at night, but I have not caught anything over five pounds not even fishing with live squid. The inside rocks and hard bottom spots are about the same as East Rock, but these areas can crank out some nice fish in the gray and afternoon. West Rock is a great nighttime spot and I have caught tons of sand bass and calico on this tiny little spot over the years. There is a lot of hard rock bottom around the rock, which more times than not produces better than the rock itself. Bait brown is my bait of chose in this area and then stripped mackerel. I fished this spot in October 2008 with my fishing partner Wayne and we had a great nighttime bite on 5” Big Hammer swimbaits in the Toast color. Once the current slowed, the bite switched from a swimbait bite to a grubs/creature baits bite. The hot ticket was to slow crawling a 5” grub or creature bait across the bottom. The fish were stacked 100 yards down current from West Rock and it was bass fishing at its best. Most of the fish were in the 2 to 3 ½ pound range, but after a few hours we ended up 6 calicos bass from 5 ¼ to 6 pounds. Up the line towards Palos Verdes there are a lot great spots. Just as fishing in the day, the kelp line can be very productive. It has been a few years since I have fished K.O.U. Rock at night, but it used to be a good spot. 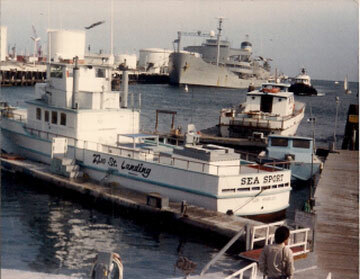 Marine land Reef has always been a good spot and has kicked out many trophy calicos in the dark. Marine land Reef is one of those spots that you will either have a great bite on the 1 to 4 pound bass or it will produce a couple trophy bass and then shut down. So if you are catching lots of the cookie cutter bass I recommend moving on if you are truly looking for the bigger models. 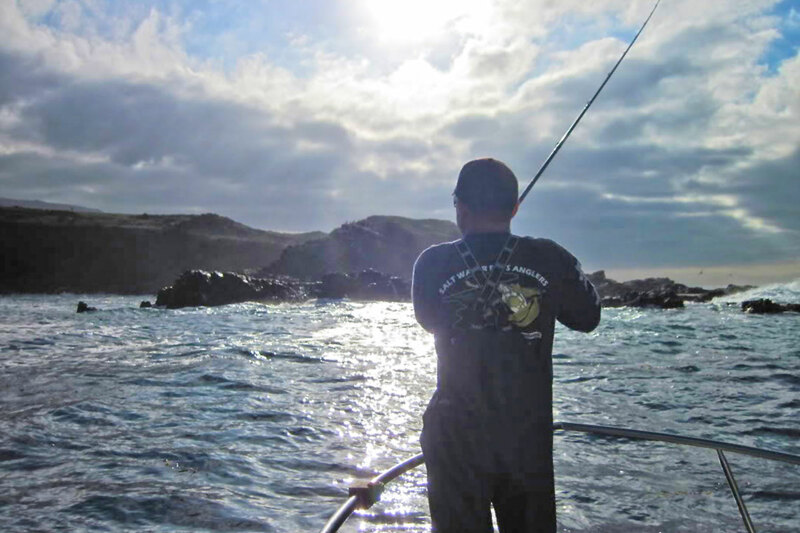 Abalone Cove can be a great area and not just for calicos, but sea bass. If you want to target the sea bass in this area I have had some of my best sea bass fishing in this area fishing a few days before a new moon, when the tides are better. We have caught more than our share of big sea bass from this little cove over the years. There are quite of few isolated rocks in the cove that normally will produce a bass here and bass there. If the water is in the 60s try fishing the inside kelp and boilers. The inside boilers near the Trump Golf Course can produce nice bass fishing at night, but be careful. As you continue up the line there are a lot of spots past Point Vicente, but there are too many isolated boilers that can ruin your night, so I am not going to recommend this area unless you have logged many hours fishing this area in the day time. I will allow you to make the decision if you have the navigational skills and the local knowledge of this area to be able to navigate your way safely through the death traps common to this area at night. Let me begin by stating I have caught a lot more big fish over 8 pounds at night on live mackerel, brown bait and squid than artificial lures, but I definitely caught my share of big calicos and sand bass over 8 pounds on swimbaits, top water, and grubs fishing deep water structure spots at night. So I am going to discuss these lures since this is the most common type of lure use by the West Coast inshore saltwater bass angler. There seems to be an endless variety of swimbaits on the market today and all of them will catch fish. Selecting the proper size and color is an important part of calico bass fishing, but this becomes even more critical at night due to the lower visibility due to low light. Each of these elements plays a role in making the swimbait look and behave as a natural baitfish. I prefer swimbaits with a larger tail, because the larger tail creates more surface area resulting in more water being pushed as the swimbait swims through the water column. The larger volume water being pushed improves your odds that the bass will detect the present of the lure through their lateral line or as I learned it in school “vibration detection system”. I believe in the old saying “Big bait, Big Fish” and that is why I will generally fish 6” or larger swimbaits at night. The larger body profile and tail can be critical at night. I fish darker tones at night when burning a bait across the surface or near the surface. When fishing deeper structure I will fish dark shades, but I will also focus on my colors selection in chartreuse and chartreuse green color schemes, but don’t leave out fluorescent yellow. Some of my favorite Big Hammer colors are Senorita, Redrum, Keyline and Margarita. 5” and 6” grubs in red with gold flake, chartreuse with gold flake and hot pink are always a good choices. I am not a believer in the phosphorescent colors except for jigs and lead heads when fishing for sea bass. Another lure that has produced good results in recent years for me is the chatter bait. The chatter bait is the best of three worlds it is a combination of a spinner bait, jig and crank bait. With the blade attached to the eye of the hook it acts as a weed guard to minimize snags, which is great when fishing structure at night. 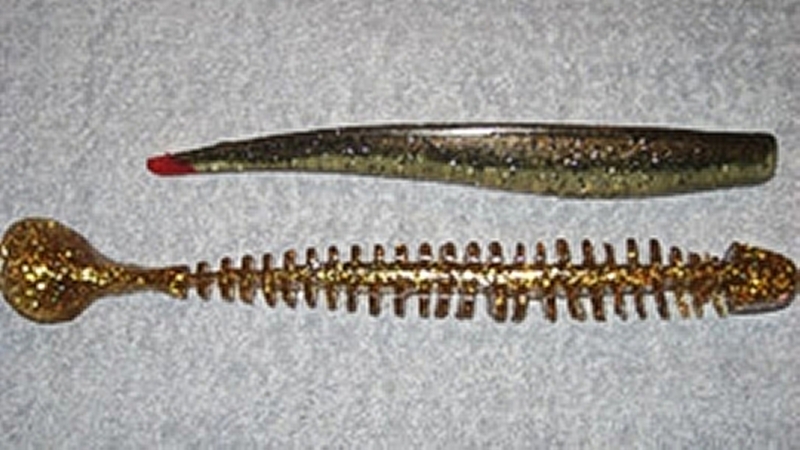 The placement of the blade provides the lure with a rapid back and forth wobble, which provides the lure with a unique “Sound Signature”. The chatter bait with its sound signature ensure that the bass will be able to detect the lure in low light conditions and at times this is the lure that saves the night. Since I fish a lot of deeper structure at night I have to build my own chatter baits in order to get them on 2 oz. lead head and accommodate the plastic bodies I like fishing. As a general rule I use ¾ oz. to 2 oz. lead heads with a 5/0 hooks for my swimbaits. The weight will depend on the wind and current, but I preferred for my lure to fall fairly fast to the bottom and once there I want it to stay in the target zone for as long as possible. Even though you do everything correct there are many nights when you cannot catch a fish let alone get a bite. If you reflect back to your high school chemistry and physics classes you will remember your teacher telling you all of the unique properties of water. The property that should get your attention is that sound is amplified, travels faster and over a greater distance in water. To capitalize on this property, I will some times insert a glass rattle into the base of the tail of the swimbait. The rattle generates a position sound and when the bite is tough this is sometimes just what is needed. This also works great when fishing creature baits tight to the bottom. Today there are a lot of companies manufacturing slugs and other plastic top water baits, but back in the 80s there were very few companies that made anything that was suitable for saltwater application. I would fish a Worm King Dinosaur Texas rigged at night and worked the edges of the kelp line and caught some bass at night pitching the massive swimbait onto or near the kelp. But the design and placement of the hook did not result in a lot of hooked fish in spite of this; the phenomenal top water explosions the massive swimbait triggered were well worth the many miss fish. Frustrated with the baits performance I started pouring a 9” rib worm with a swimbait tail and my catch ratio increase three fold. Currently one of my favorite slug type baits for fishing at night is manufactured by Cory Sanden from MC Swimbaits. The D hook: Is an old school method for rigging your Iron a bit more weedless. Big profile baits can be very productive when fishing the surface in the kelp at night. Cory has designed a bait that has a large profile that casts a nice shadow on the surface at night. At night, I like fishing the 8” Slug with an 8/0 Owner or Mustad hook. When fishing the MC slugs I fish a Shimano Trinidad 12 spooled with 65 lb. Power Pro mounted on a Shimano Teramar Inshore Breakwater (model 69MH) rod. Since the release of the Teramar Inshore Breakwater series rods approximately 5 years ago they have been fast approaching the rod of chose for this type of fishing. The breakwater series rod works well for fishing these top water baits and has the power to turn any bass. As with the swimbaits, I have found by inserting a large glass rattle into the slug can increase your strikes at night. Do you see a pattern here? Rattles, chatter baits, larger tail designs, big body profiles I am a firm believer in low light conditions you need to capitalize on a fish’s ability to detect movement, sound, and pressure through their vibration detection system. As for colors, I have found that colors in the black and brown tones seem to get bit better and this is because they provide a better contrast against light given off by the stars, and moon. Fishing the iron at night, who would ever guess that this could be a viable option. Fishing a Tady 45, Tady AA or other similar iron at night can produce fish. In the old days we would repaint our store brought iron so they are a little more suitable for night fishing. After sanding the iron, the iron would be re-sprayed with one of our favorite base colors, red/orange, black/gold, black/orange were some of the most productive colors. While the base coat was still wet we would add large glitter to the iron. Once everything has dried a clear coat would be applied over the top of the iron to seal the system. Once the system had cured we had ourselves a very productive nighttime iron. One of my most productive colors for me was a Tady 45-painted black with gold and red glitter on the bottom portion of the iron. This color combination has produced many trophy bass at night. Another thing we would do is change out the hooks on the iron to make them more “Weedless”. 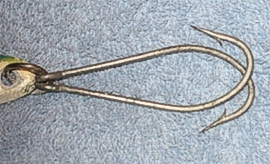 We would remove the treble hook and replace it with two single hooks. The key was to mount the hooks, so that they are facing each other. This seems to work fairly well at minimizing the iron getting hung up in the kelp. I have always used fish attractant when fishing, but I especially use it when fishing at night. There are a lot of scents on the market today and many work well, but I like ProCure, because it is made from real baitfish that calicos and sand bass feed on. By applying fish attractant on your lure helps to provide a scent trail that the bass can follow straight to your offering. Nighttime bass fishing is an experience that you will never forget and when all of the conditions come together fishing can be unforgettable. Being out on the water on those flat chilly winter nights with no one around are some of my best memories. I hope the information outlined here will be useful and will help you in your pursuit of trophy bass. 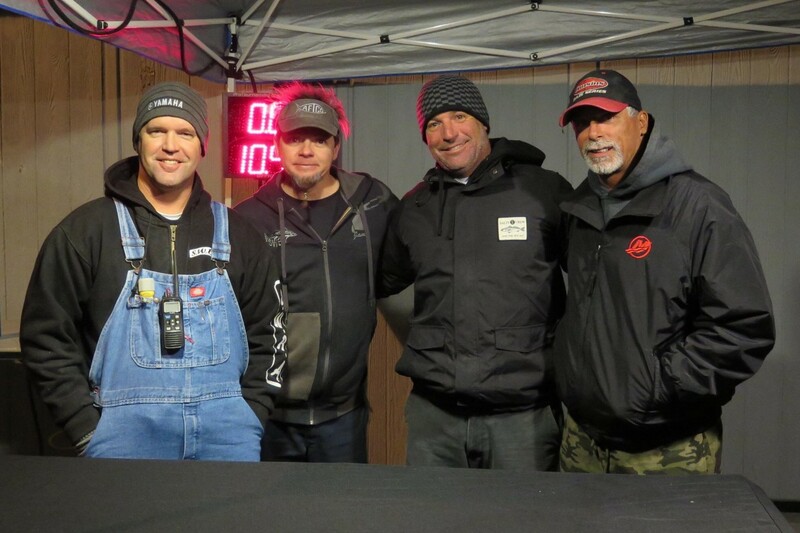 A lot of the information was derived from my experiences of fishing at night for bass and as with any information some of the information is debatable, but there is one thing we should all agree on and that is how important it is to protect our calico bass fishery. There is no better feeling of accomplishment when you have done all of your homework and are able to apply the knowledge you have acquired and go out into this massive ocean and locate and catch a trophy bass. However, there is one decision that is more important than your bait selection, rod and reel selection and fishing spot section and that is the decision to kill or not to kill. The decision to kill or to release this amazing fish needs to be made long before a net is slipped under it. I hope you cherish the bass fishery as mush as I do and the decision you come to prior to going fishing for these trophy bass is to release them. Remember the trophy bass that you are holding in your hand represents all of the other fish that have lost their lives to gills nets, fisherman, predators of the sea, and the fish you have caught has survived it all and has earn the right to be treated with respect and released to fight again. There is a time to harvest and a time to release, but the trick is to know when. 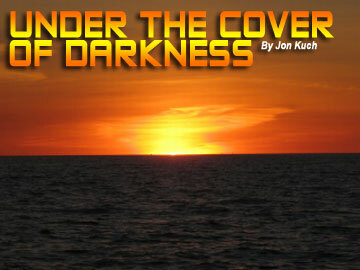 No Replies to "Under The Cover Of Darkness"